Did you know that language learning helps improve our creativity levels and our analytical skills? And gets you promoted in the workplace? And makes you more open-minded? And of course, we all know now that language learning also delays dementia! So, why not equip yourself for a happy, healthy and successful life on the global stage, and take a language course while in College? Our School offers a wide range of elective language modules to all Trinity College undergraduate students who do not study a language as part of their degree course. These modules aim to improve your readiness for Study Abroad programmes in Europe and in East Asia, and to enhance your career prospects. Our language modules are open to (i) all undergraduate students as an extracurricular option, and (ii) are also available to undergraduate students for credit within the Broad Curriculum programme. More information on credit-bearing language modules within the Broad Curriculum programme is available on the TCD Broad Curriculum web site. Whilst these classes are offered as part of the university's undergraduate programme, we try our best to facilitate postgraduate application where spaces are available. Classes begin in the second week of the first term (Michaelmas term) and run for two terms, with a weekly 90 minute or 2 hour class. It is important to note that these are not grammar or conversation classes, but instead involve group-based projects with spoken and written components which try to get you speaking and writing in a meaningful way through the language you are learning, especially to communicate about your academic studies and your own personal interests and activities. 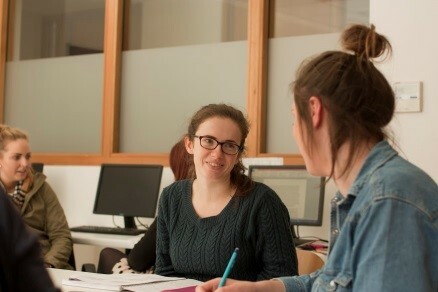 We also offer English language modules for TCD and non-TCD students through the classes in the Centre for English Language Learning and Teaching. Online application form for optional (not-for-credit) language modules. Online application form for Broad Curriculum (credit-bearing) Language Module applications. A waiting list is employed for modules which are over-subscribed, and several rounds of offers are made at the start of Michaelmas term. If you not do obtain a place, you may enrol in later College years. Offers are sent by email at the end of September, following the closing date. Due to the high number of applications, we are unable to respond to students who do not obtain a place. Students may be placed in their second or third choice of language module, so please consider your choices carefully. Please note that the native and near-native speakers are not eligible to apply for this programme's non-beginner classes (B1) classes. These are at an intermediate proficiency level.